We Stab People For FUN! 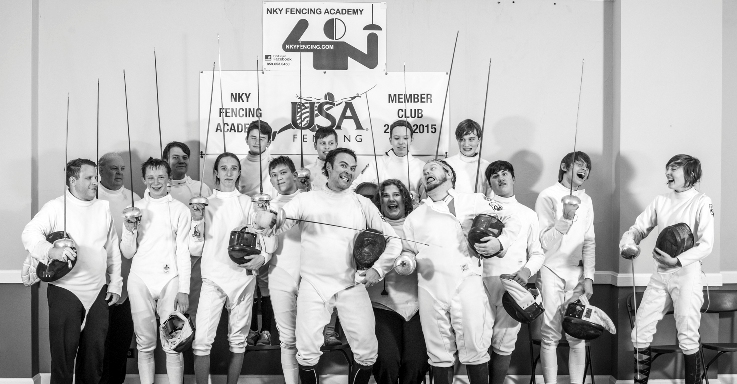 We are NKY Fencing Academy, an epee sport fencing club in Northern Kentucky. We focus on providing fencing instruction to everyone, in a fun and safe environment. Learn to fence - you will love it! FENCING is a great way to exercise, relieve stress and improve your balance, speed, hand-eye coordination and confidence. There is no sport more satisfying and challenging, both physically and mentally. We meet at our salle (fencing studio), located at 301 C Elm St, Ludlow, KY 41016. NKFA salle has an amazing wood floor, and eight state-of-the-art, electronic scoring strips with three VSM displays per strip! Tuesdays and Thursdays 6-8:30 pm. Group class is 6-7 pm, followed by open fencing 7-8:30 pm. Open fencing Wed, Fri and Sat. Fencers must complete intermediate epee session (or have equivalent experience) to join regular classes. NKFA hosts five regular epee tournamants every season! Our events are Y10/12,Unrated, Div 2 and Open/Senior. All epee, all the time! We are a fun bunch. Now that we have our own salle, our club is stepping up our epee game, becoming more competitive! We will, however, remain the friendliest and most welcoming club around! Guarnateed! We'll open our home to you, and then stab you with the biggest smile on our face. Because, that is what we do. We stab people for fun. Amazing light. Fantastic wood floor. Eight electronic scoring strips with triple VSM display per strip. Did we mention that our salle is above a coffee shop and a rum distillery!? Can it get any better than this? Best fencing facility around! Our studio is also available for leadership workshops, fencing birthday parties and similar events. Contact us for more info. “Confodere populus et grande tempus!” ~ We stab people for fun!